Assuredly, this is one great (tragic) story. So often recommended and the only thing holding me back was the cliffhanger. I was waiting for book #2, and ahhhhhhh finally! It has been released, which meant I could finally read this one. Caroline: I really like Reason to breathe! It kind of remind me of Heart on a chain, Im waiting for the sequel though. Totally recommend it. Tess: If you don’t like ‘iffy’ endings definitely wait for sequel to Reason to Breathe! 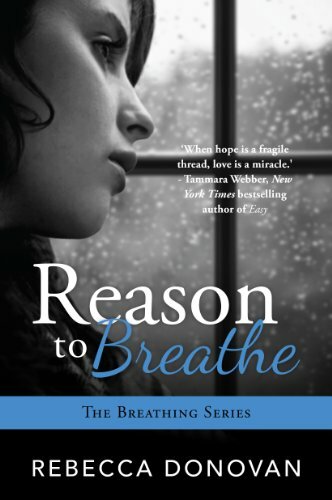 Wish I had of done that, the wait is absolutely KILLING me…..
Julie: Do NOT read Reason To Breathe until May when bk 2 comes out! Great book, emotional etc but worst. Cliffhanger. Ever!! Cannot wait for book 2! If you can stand the wait tho it’s so good!! Gitte: I did…I didn’t listen when everyone told me not to!!! I LOVED it and cant wait for the 2nd one!!! Jamie: HATED that ending!!! I wanted to write the author and tell her that she seriously messed me up for a good few days until I went to her website and saw there was going to be a sequel. I am going to have to re-read the first one b4 I read the second. I loved that book. Maryse’s Book Blog: Thank you for that confirmation of what I was already waiting for. Makes me feel better. I’m dying to read this but I hate cliffhangers. Well I take that back. I LOVE them… as long as I can move on to to next book right away. Kasey: Was looking for a new book to read and came across this suggestion. And may I say, i am a terrible terrible listener …..I am now going to read this book because it sounds good lol and I’m a glutton for punishment I guess! After all of that, it was obvious this was a MUST read!! And I can completely see how and where so many cried. While I can say I didn’t cry, it is not due to having read the book emotionless. I felt the pain deep within me. The sense of loss and terrible injustice. The why. The HOW?! I certainly had a constant ache in my heart, but my fury overtook everything I read this in this book with a side of hate. Not for the book, but for the villain, and she was one of the worst villains I have ever encountered. One of THE most HORRID!!!! I needed a break before writing the review. I needed to digest the book, contemplate it before I went on an angry rant. I had to write it, but I had to get over it first. It’s been a week, and I’m ready to face it. Now.. I admit, I am luckier then most who read this a year ago and ended with that absolute cliffhanger of an ending. Because I read this knowing I could immediately jump into book #2. And with that knowledge, despite all of the painful circumstances, flourished a tendril of hope. Knowing that *if* there is a book 2, that maybe… there was still a chance for more. Knowing that no matter how this one ended, it was not necessarily over. So I will admit, that I had a form of comfort at my disposal that many of you did not. Had I read this when many of you had originally read it, I too, may have sobbed my heart out. Instead of giving in to sadness, I felt hate. I hate the word hate. I do. I avoid it like the plague. I try to contain my “similar” emotions with positive sides to the *thing* that is making me feel so negatively. I try to learn from that kind of emotion. Discern it. Dissect it. Find the good within it, no matter how hard. But…. I’m not not that good at it yet. Especially with this one. Instead of trying to find good (and really how could I? Good in that?? how?) I just went with my gut feelings. But instead of crying and releasing that anger in a form of hurt, connecting on a different level with the book, I went with my most basic instinct. I fumed. I’m going to short-form the synopsis, because I went into this not knowing much, except that this was a devastating, dark and hard book to read despite so many loving it. I experienced the shocking revelations in their purest form. Emma, a 16 year old high school student is an overachiever. And a successful one at that. She has a 4.0 grade point average in advanced classes. Participates and leads many high school activities, and is considered a top athlete. I wasn’t embarrassed by my grades or what other students thought of my high marks. I knew I earned them. And I also knew that they were going to save me someday. Her social life is devoted to her schoolwork and after school activities, and she only has one friend that she cares to keep. Emma is a beautiful recluse, an enigma to the rest of the students (and staff). One that could so easily ride her high school life on a wave of popularity and success, instead she chooses to keep her head down, and her interactions limited. Being the best friend of the most popular girl in school (Sara) is enough of a social life for her. And her best friend knows exactly why Emma is the way she is. What no one understood, besides Sara, was that all I really cared about were the days I counted down until I moved out of my aunt’s and uncle’s house to go to college. So if I had to put up with the whispers behind my back as I received the highest marks in the class, then so be it. They weren’t going to be there to save me if I did anything but succeed, so I didn’t need to get involved in the gossip and typical teenage tripe. 1.) She needs a scholarship of her future as it is the only thing that will save her from her current situation. 2.) Her schoolwork is a distraction from her atrocious home life and frequent physical punishment from a family member that should have nurtured her, but instead, chooses to torment her. If anyone were to observe this routine, they would think this was the picture perfect America family sitting down to enjoy dinner together. The picture changes when I crept out of the room. The air became thick with discord with the crushing reminder that I existed, a blemish to their portrait. And while I struggled with my anger, after some time away from this story, I see that with the negative came a beautiful positive. A strength built over time, and certain connections that were not easily executed but formed naturally and out of necessity. Real, unbiased, self-sacrificing love. The very thing the heroine was robbed off as a young child. One that, despite her terrible situation, and the terrible outcome of her young life, she was able to realize. And with that love, grew a strength. This book will take you on a dark journey, and you will feel every emotion possible. Sadness and anger being the most obvious, and moments of absolute horror-movie style fear (even though the monster in this one is human). But it’s not all dark. You will encounter plenty of the good in life, too. Like… the cute “new guy” named Evan. He peered down at me in anticipation. Infatuation and love. Success. Friendship. Breakups. Even parties!! Lots of *normal*, within an absolute abnormal life. But what happens when “normal” and “abnormal” threaten to collide? After a short silence, he consoled, “I promise it will get better.” I knew he was promising something he knew nothing about, but I forced an appreciative smile anyway. I’ll let you experience the rest. Highly recommend, but I do so only if you are able to fully immerse yourself in all that this book will throw at you. Off to book #2 (Barely Breathing) I go! Me too!! I’m ready for it!!! I love the cover art for book 2! CREEPY!!! I have to say I was really pissed throughout the book at the aunt but also at Evan and Sara. I don’t think keeping her secret was right and that really burned me hard. The second book is better but comes with a new heartbreak or two. These are really engrossing and heartwrentching stories. Ok I am seriously hoping this gets better. I am only to chapter 5 and I am having a hard time wanting to continue. Her aunt is such a raging beeotch, I seriously want to punch her. I am lost with the cover. Please tell me. I read both books months ago and I can not wait for the third. I want to read them again, I just don’t think I can handle it. I almost threw my kindle across the room at work. I am clueless I know. I just started to read book 1 last night and I’m extremly upset already. Emma’s Aunt is a bully and her Uncle George is just as bad for turning his back on Emma, allowing his wife to abuse her wtf? I will continue to read this book and hope at some point Emma’s story gets better. OMG! I truly and desperately want to read this series but I’m scared… I truly dislike it when the main character is bullied (in any shape or form) to the maximum and you feel like you can’t breathe anymore. I don’t find any pleasure in a novel that is just based on despair, hurt, pain…. I need happiness and it seems…well I am hoping that this book does have a good – fun – steamy – happy side to it. can someone clue me in what the cover is?? ?